"with its vision of a world where pollution is out of control...is that I invented literally nothing for it, bar a chemical weapon that made people psychotic. 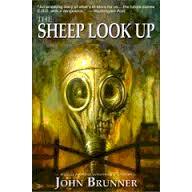 Everything else I took straight out of the papers, and magazines..."
and if you think about that for just a moment, alarm bells should be going off in your head -- this book was first published over 40 years ago. Despite the grimy, thirsty feeling I was left with, this book also struck me as being one of the best works of environmentally-based fiction I've ever read. There's just something masterful in the novel's message of a clear and present danger for our future. With only a few pockets of exception, the United States is a veritable cesspool. 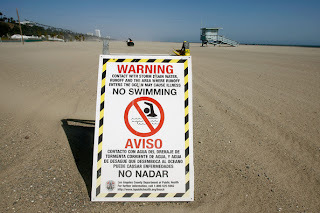 The seas are polluted beyond repair, acid rain in New York eats holes in people's clothing, the air is so bad that filtermasks (sold in vending machines) are required just to be outside, and "Don't Drink" the water alerts are common. Trash lays out, uncollected, spawning rats and other pests; exterminators are way too busy to come to one's home at short notice. Health problems are widespread, stds and other diseases normally treated by drugs have developed antibiotic-resistant strains, and parents whose children are born with only minor ailments or physical problems are considered extremely fortunate. The American government is run by a leader known as "Prexy," whose policy is one of blatant denial and blaming all of America's ills on terrorists. One man, Austin Train, knows the truth -- and he is public enemy number one where the government is concerned so is forced to go underground. Train is a committed environmentalist whose works have been studied and followed by others who have settled in commune-like places called wats where they put into practice what we'd call today "going green." Train is a peaceful person but many who have taken up his cause for a cleaner America are not. The "Trainites," as they call themselves, believe in more violent means of trying to "fix" things, something Austin Train would never condone. The story in this novel is related via a number of varying plotlines and narratives that seem choppy at first but actually have a rhythm and a purpose, all melding together beautifully as the novel progresses. It begins with the bizarre death of Decimus Jones, a friend of Austin Train, on an LA freeway. His strange death becomes an event that will eventually draw together the stories of every character in this novel in a roundabout way, all of whom are caught up in the country's growing state of emergency in their own fashion. Punctuating their ongoing stories are bits of speeches, news reports, poems, songs, television-show transcripts and scenes from outside the country, where the army is at war with its current enemy in Latin America. While this strange format may seem a bit disconcerting and jarring, once into the story, you are stuck as you eagerly flip pages to see how things are going to end. As a bit of a warning, don't get too attached to any one character or groups of characters, because things tend to get very bleak here with an unequivocal aura of despair surrounding pretty much everyone. Old this book may be, as noted above, published some 40 years ago, but it is still very much worth the read. The author has this way of thoroughly unsettling and disorienting his readers while keeping things moving at a fast pace, all the while making his point about what our future might look like in the not too-distant future. Pooh-pooh the didacticism if you so choose, which many people do, but imho, this is a novel that everyone who cares about and doesn't just give lip service to a better future might want to read. Don't forget the afterword -- the nonfiction, which should scare you even more than the novel did.